FPGAs (Field-Programmable Gate Arrays) can be found in applications such as smart phones, mp3 players, medical imaging devices, and for aerospace and defense technology. FPGAs consist of logic blocks and programmable interconnects. This allows an engineer to start with a blank slate and program the FPGA for a specific task, for instance, digital signal processing, or a specific device, for example, a software-defined radio. Due to the short time to market and ability to reprogram to fix bugs without having to respin FPGAs are in increasingly high demand. This book is for the engineer that has not yet had any experience with this electrifying and growing field. The complex issue of FPGA design is broken down into four distinct phases - Design / Synthesis / Simulation / Place & Route. Numerous step-by-step examples along with source code accompany the discussion. A brief primer of one of the popular FPGA and hardware languages, VHDL, is incorporated for a simple yet comprehensive learning tool. While a general technology background is assumed, no direct hardware development understanding is needed. Also, included are details on tool-set up, verifaction techniques, and test benches. Reference material consists of a quick reference guide, reserved words, and common VHDL/FPGA terms. 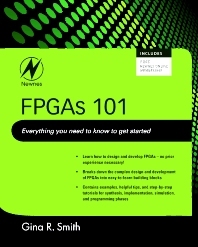 Learn how to design and develop FPGAs -- no prior experience necessary!